Mark you calendars: The Majors April 29-May 1 at Summit Point. The annual Mother's Day weekend (May 7-8) MARRS/SARRC Challenge at VIR is now open for registration. The South Jersey Region will be hosting MARRS 4 on the Lightning, June 4-5. And we are just putting finishing touches on MARRS 5 at Summit Point June 18-19. 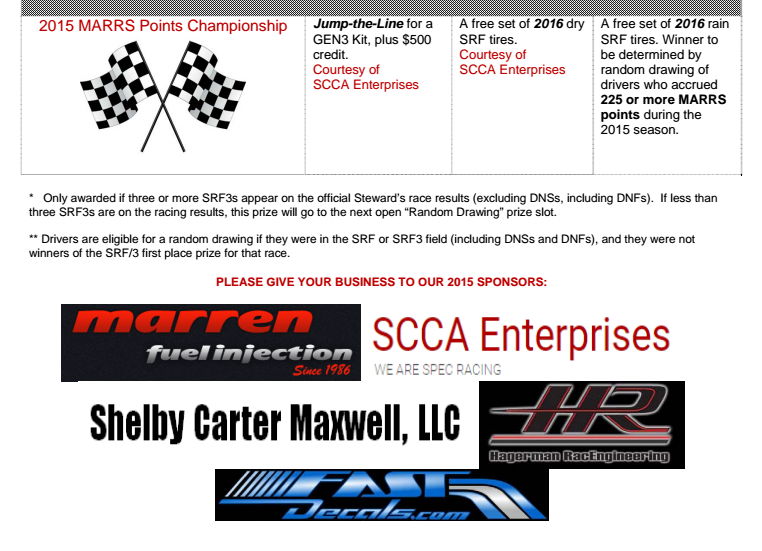 Attention SRF/SRF3 Drivers - 2015 MARRS SRF Prize Program. Note: You can download this information in .pdf format at the bottom of the page or from the Club Racing Resources. If you have any questions, please contact the Club Racing directors.